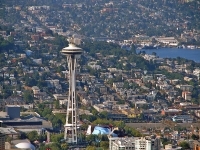 Seattle's skyline, with the prominent Space Needle, is one of America's most recognisable cityscapes which hints at the eclectic attractions below. 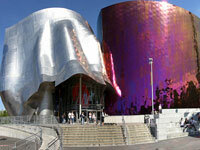 The attractions in Seattle both celebrate and preserve various roles in history, alternating from aviation and shipbuilding industries, the music epicentre and the Native American and contemporary art centre. Other attractions let visitors enjoy the moment, including three sports stadiums, an aquarium, zoo, music laboratory, and festive city districts. Sightseeing Seattle's watery attributes can be enjoyed criss-crossing Puget Sound in state ferries or from the lively waterfront shopping area Pikes Place Market. Among the other highlights are the great museums showcasing the history of flight, contemporary art, an ode to Rock 'n Roll at the Museum of Pop Culture, and of course, the views from the Space Needle. Yet perhaps the best thing to do is follow the locals in and around the city to see and enjoy Seattle the way they do.